Business relations are crucial and the communication sent across make a lot of difference to customers and the prospects. Tracking, analyzing and understanding customers would be pretty hard if technology is not used to manage this relationship. Customer relationship management system helps businesses to manage the customers and their interactions effectively and help automate and synchronize sales, marketing, customer service and technical support across the divisions. Today acquiring business has gone social with the introduction of Socal Media. CRM solutions have to be smarter and social media aware to be able to make an impact in customer acquisition, analysis and customer attractions. 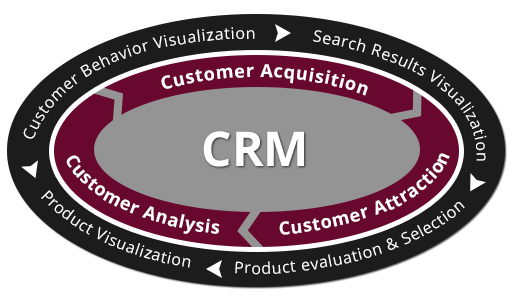 Carmatec’s Custom CRM Solutions are tailor-made to suit all of your CRM requirements. We build CRM Solutions which are intuitive, straight-forward, refined and can be personalized anywhere. With our specialized CRM solutions, you will have the time to focus on your core business strategies and overlook time-consuming tasks like hosting, infrastructure requirements and maintenance tasks. We help you choose the ideal components of the future CRM systems to suit your business through our experienced developers. They will help you comprehend all the implementation methodologies and guide you choose the best in the industry.